U.S. President Donald Trump and his Chinese counterpart Xi Jinping are not expected to meet before the March 1 deadline. If no deal is reached by then, the U.S. will likely raise tariffs on USD200 billion of Chinese imports from 10% to 25%, further escalating the trade war. Previous reports that he would meet the Chinese President in Danang were dismissed by U.S. President Donald Trump. His meeting with North-Korean leader Kim Jong-un on February 27-28 will take place in Hanoi, not Danang, as earlier reported. The chances of a deal being reached have diminished as President Trump emphasized that no deal could be finalized without him meeting President Xi Jinping. Moreover, a deal would require real structural change in China in order to “end the theft of U.S. jobs” and “resolve long-standing complaints of unfair practices”, Trump has said. The deal would also need to include an enforcement mechanism. During his State of the Union address, Trump renewed criticism that Beijing had for decades taken advantage of the “calamitous trade policies” of the U.S. “We are now making it clear to China that after years of targeting our industries and stealing our intellectual property, the theft of American jobs and wealth has come to an end,” Trump said, noting his “great respect” for Chinese President Xi Jinping. Chinese Vice Premier Liu He will hold a new round of trade talks with U.S. Trade Representative Robert Lighthizer and Treasury Secretary Steven Mnuchin in Beijing on February 14 and 15. Vice Minister level talks already started on February 11, with the U.S. team for those headed by Deputy Trade Representative Jeffrey Gerrish. 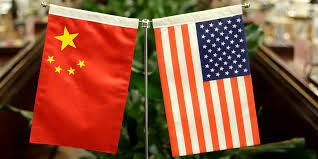 Since the leaders of the two countries reached a truce in December 2018, this is the third round of talks between Chinese and U.S. officials in 2019, reflecting the urgency with which the two sides are treating the negotiations. It follows high-level meetings on January 30 and 31 in Washington, where both sides hailed important progress, and a round of mid-level talks in Beijing in early January. Chen Fengying, Research Fellow at the China Institutes of Contemporary International Relations, told the Global Times that she is optimistic about a “phase-based” framework agreement before the deadline. Chinese Ambassador to the U.S. Cui Tiankai has said that too much emphasis had been put on competition and that the two sides should focus more on cooperation for mutual benefit. Relations between the two countries and their companies would only suffer under the destructive nature of a “zero-sum” or “winner takes all” mindset, he added. China opposes a report by the U.S. Trade Representative’s office on its World Trade Organization (WTO) compliance, the Ministry of Commerce (MOFCOM) said, saying it is inconsistent with the facts. The report was based on U.S. domestic law rather than WTO agreements and multilateral rules, MOFCOM said. A considerable part of the accusations against China in the report exceeded its commitments to the WTO, lacking legal and factual basis. China firmly supports the multilateral trading system and participates in the reform of the WTO, and clearly opposes unilateralism and protectionism, it added. Hundreds of farmers and business representatives last week pressured lawmakers and the Trump administration in Washington to end the trade war by describing the hardships they are facing. “A lot of farmers are going to give the President the benefit of the doubt, and have to date. But the longer the trade war goes on, the more that dynamic changes,” said Brian Kuehl, Executive Director of Farmers for Free Trade. In some regions farm bankruptcies are rising. One of the U.S. trade negotiators, Undersecretary of the Treasury David Malpass, has been nominated by President Trump to become President of the World Bank, but meanwhile he would continue to assist in the trade negotiations, traveling to China this week together with U.S. Trade Representative Robert Lighthizer and Treasury Secretary Steven Mnuchin.